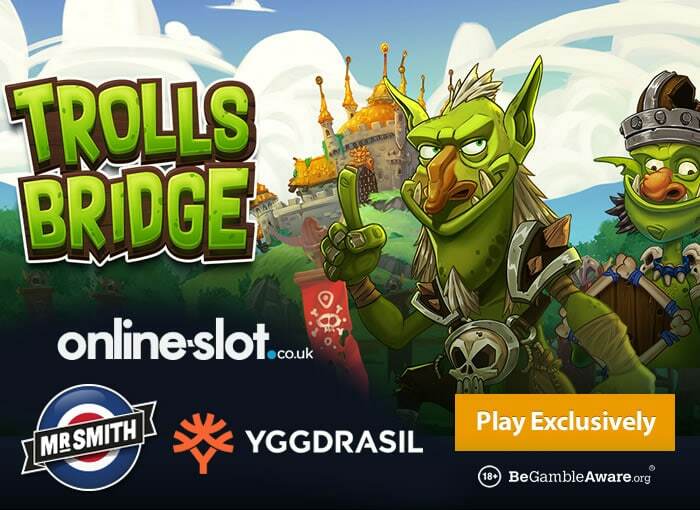 Yggdrasil Gaming has announced that they will be releasing the Trolls Bridge slot early next year (January the 8th 2019) – however, it can be played exclusively early right now. Trolls Bridge has a fantasy theme and is based on trolls where monster hordes can help you achieve some giant wins. With 5 reels and 20 paylines, you can spin away from just 20p a spin across all compatible devices including iOS and Android. Visually colourful and with a Warcraft feel, you need to decide whether you want to use the Golden Bet feature – enabling it will cost you 25% more per spin (so 25p rather than 20p a spin at minimum stakes). As a result, your chances of winning increases as well as getting an extra pick in the main bonus feature. That’s the Bonus Pot feature where you’ll get a cash prize up to 40 times your stake or up to 10 free spins with 5 feature picks. You then pick from cards to reveal additional free spins, random wilds on every free spin, sticky wilds, 2x multipliers, Troll wilds or super stacked Trolls. Trolls Bridge also comes with a Bonus Stone feature which is randomly activated in the base game – a winning combination will be subject to a multiplier up to 5x with a losing spin giving you up to 40 times your stake. Medium variance, you can win 2,000 times your stake on every free spin if you’re lucky – to play the game and read more details, visit the Trolls Bridge slot review. Now for the important part – Trolls Bridge can only be played right now at Mr Smith Casino. They also have other exclusive titles like NetEnt’s Moonshine Riches and Fire Siege Fortress. With over 1,000 slots to choose from, this UK dedicated online casino welcomes you with up to 200 cash spins on NetEnt’s Starburst – those are free spins with no wagering requirements. They also have a Yggdrasil Gaming promotion right now whereby you play Dark Vortex, Hanzo’s Dojo and Vikings Go Berzerk to win a share of £45,000 in cash.